This is the only state secretariat, where you must not speak hatefully against anybody before you will be allowed to enter. 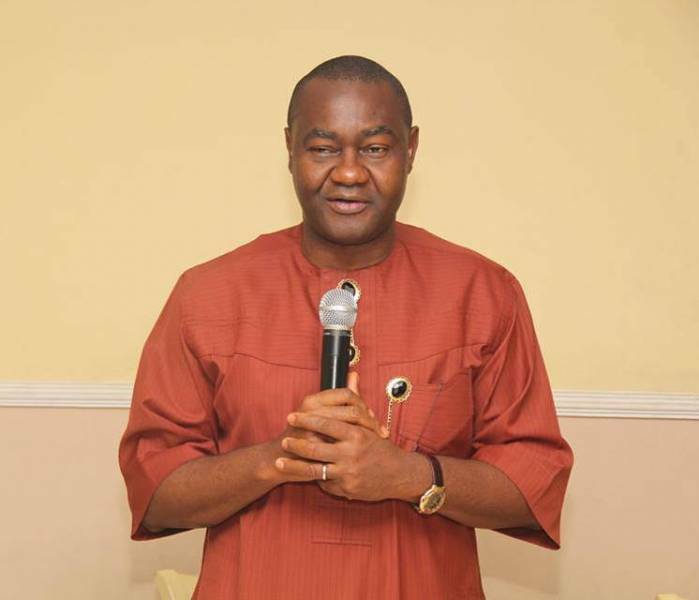 The crisis rocking the Rivers State Chapter of the All Progressives Congress (APC), took another twist yesterday, as the faction of the party loyal to governorship ambition of Senator Magnus Abe, opened a parallel secretariat in the Port Harcourt, the state capital, amidst heavy security. In his speech at the event, witnessed by crowd of supporters, Senator Abe, who is the governorship aspirant of the APC for the 2019 election, stated that the essence of opening the office was for proper administration of the party in the state. He noted that what the APC needs in the state is peace, and berated those who vandalised the office last Saturday, adding that attacks would not restore peace in the state. “God is the power that made us open our office. He is the only power that brought us here safely and will lead us home safely,” he said. “This is a move about peace, it is a movement about growth and progress and we will not be provoked into shading blood. “I want to thank members of the state executive council, who have ensured we gather here today. It is the executive of the party that we have here that was put together by all groups in the party. “This is the executive that was in place when the court gave an order that we should maintain status quo and voided the congresses at that time. In view of the legal tussle in our party, this is the only executive that does not have any legal or moral impediment. “I want to associate myself with them and say that I support them. This is the only state secretariat, where you must not speak hatefully against anybody before you will be allowed to enter. As far as you believe in APC, as far as you believe in Buhari and you know that Adams Oshiomhole is our chairman, this office belongs to you. Meanwhile, the Independent National Electoral Commission (INEC), has promised to conduct a free, fair and credible polls in the bye-election in Port Harcourt City Local Government Area Constituency III, for Rivers State House of Assembly. INEC said its target in the polls is to change the perception of the people of the state about election and added that elections must not end in crisis. Deputy Director and Head of Voters Education and Publicity Department of the commission, Rivers State, Mr. Edwin Enabor, spoke at the commission’s headquarters in Port Harcourt, yesterday, after the distribution of the materials for the election. Meanwhile, no fewer than 1,500 security officers are expected to man today’s election. This is the information disclosed by the State Commissioner of Police, Zaki Ahmed. Ahmed said the operatives would ensure peaceful, free and fair exercise and appealed to all residents to cooperate with concerned authorities to carry out their civic responsibility. The command with the supports of other security agencies superintending the election, has agreed that there will be restriction of movement of persons, vehicles, on land and water within the areas concerned, between 6 a.m. and 6 p.m.